Turner Classic Movies has not yet posted an official January schedule, but some online sleuthing by various TCM fans has turned up interesting information about tentative plans for that month. The information has been posted in two discussion threads at TCM. 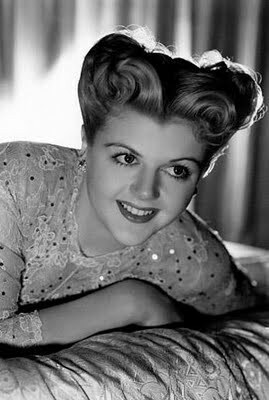 Angela Lansbury will be the January Star of the Month, with at least two dozen Lansbury films on tap. The films will start off with her earliest work, as a teenager at MGM, in films such as GASLIGHT (1943) and NATIONAL VELVET (1944). It looks as though TCM may even be planning to show the 1982 TV production of SWEENEY TODD as part of the Lansbury tribute. 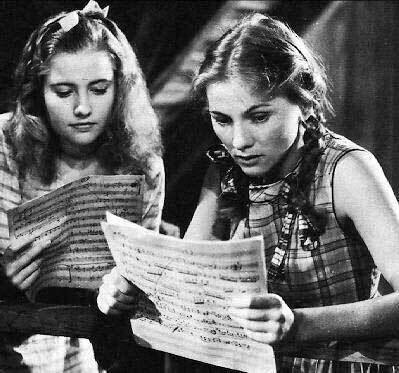 January will also feature a repeat screening of the long-unseen THE CONSTANT NYMPH (1943). For those who haven't yet enjoyed reading it, I highly recommend Jacqueline's typically thoughtful analysis of THE CONSTANT NYMPH at Another Old Movie Blog. An important footnote regarding THE CONSTANT NYMPH: Today Warner Archive shared the good news that the film will be out on DVD "before Santa comes to town." 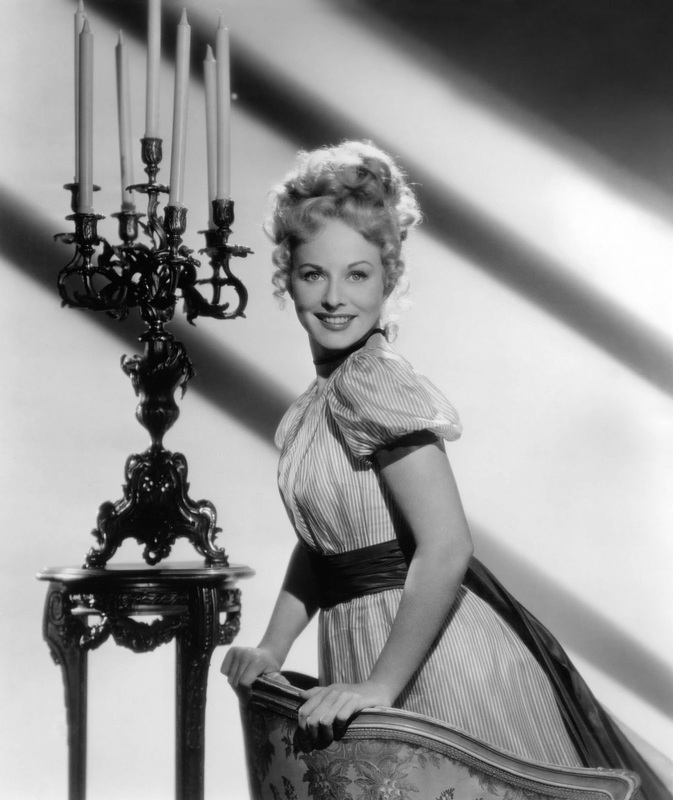 January is also slated to include a number of films from 20th Century-Fox, including the excellent Welles-Fontaine version of JANE EYRE (1943) and the Betty Grable films A YANK IN THE R.A.F. (1941), MOTHER WORE TIGHTS (1947), and MY BLUE HEAVEN (1950). A couple more interesting, relatively obscure titles which may air in January are Paulette Goddard in THE DIARY OF A CHAMBERMAID (1946) and Merle Oberon in NIGHT IN PARADISE (1946). The excellent Joan Bennett-James Mason film THE RECKLESS MOMENT (1949), currently available only on Region 2 DVD, is also on the tentative schedule. In November TCM will feature a "Battle of the Blondes, and December's Star of the Month is the greatly loved William Powell. It will be great to welcome Robert Osborne back to the station this December! Thanks for the heads-up you left on the blog about some of the January 2012 stuff, Laura. Very pleased to hear that they're going to encore The Constant Nymph, because I forgot it was on the first time they ran it. I made a point to catch up with THE CONSTANT NYMPH when they showed it recently and enjoyed it tremendously--a film as good as its reputation during all its "missing" years. Wonderful melodrama--and if you look at his other films of the period, though they are all different, this is a genre director Edmund Goulding had a real flair for--thinking of CLAUDIA, THE RAZOR'S EDGE, and his darkest melodrama NIGHTMARE ALLEY. I believe Joan Fontaine favored this along with LETTER FROM AN UNKNOWN WOMAN as one of her favorites--that's high praise because LETTER is one of the most sublime films ever. But indeed, she is great in this too, and there are some interesting affinities in the two characters. I'm sure it will be run a lot on TCM now that the rights problem is over, as well as being on DVD, so just to join in recommending as a film for anyone and especially if you classic melodrama of the period. Thank you so much for the link, and for keeping us up on what's happening on our favorite channel. So glad Mr. Osborne is returning. Wow, very interesting about "Diary of a Chambermaid" and "Night in Paradise." I hope they don't get cancelled, which sometimes happens with the rare titles. Looks like some good programing for those cold winter months coming up.